Just across the border into Victoria is Croajingolong National Park, a UNESCO World Biosphere Reserve that is home to diverse eco systems and magnificent scenery, including secluded beaches, dramatic rocky coastlines as well as a wonderful array of flora and fauna. The charming town of Mallacoota is surrounded by the national park. Soak up the beauty and peace of the Mallacoota Inlet, with its shimmering lakes, rivers, forests and quiet beaches. From Cann River, make your way to Point Hicks to see sand dunes and the lighthouse, and make the most of walks and camping areas. Tamboon Inlet and Wingan Inlet, with its secluded estuary for small boats or canoes, are also popular with campers. 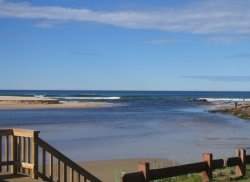 Try your luck fishing from the beach at Marlo, a quiet holiday village, or explore miles of sandy beaches, rock pools, boardwalks, bushwalks and lookouts at Cape Conran Coastal Park. Keep an eye out for dolphins and seals in the ocean. Head inland from Nowa Nowa and visit Buchan Caves, raft down or horse ridealong the Snowy River.At Lakes Entrance, Victoria’s fishing capital, cast a line from a jetty, riverbank or beach. The lakes are the largest inland waterway system in the southern hemisphere, with four rivers feeding the five main lakes of the system. 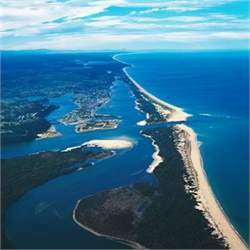 Sheltered from the rough ocean seas by Ninety Mile Beach, the Gippsland Lakes are a centre for water-based recreation and fishing. In the picturesque holiday village of Metung you can sail across broad Bancroft Bay. Book a table at one of Metung’s fine restaurants or enjoy a pub meal on the waterfront. Spot koalas in gum trees on Raymond Island, as well as other wildlife, including kangaroos, wallabies, echidnas and lizards.